Keynote Speaker: Professor Tove Malloy (pictured), member of the FCNM Advisory Committee to the Council of Europe. Speakers to include: Cllr John Pollard - Leader of Cornwall Council, the Grand Bard, Andrew George, Mark Trevethan, Dr Bernard Deacon, Gail Bishop, Jane Howells, Angela Angove, Sarah Tresidder. Conference MC – Adam Killeya. Cornish singing and storytelling event with the Boilerhouse Singers, The Cape Singers, Stephen Hall (pictured) and Liz Harman. A conversation about the future for Cornish. Arranged by ALL the voluntary Cornish Language Groups to discuss the language community's view on the way forward for Cornish. All learners, supporters, speakers and activists are encouraged to take part in a one off opportunity to come together to form an action plan for the language community. 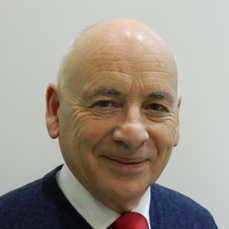 Dr Ken George is the former Principal Lecturer in Ocean Science at Plymouth University and influential Cornish linguist, author and poet whose publications include several dictionaries of Cornish. Mick Paynter guided bi-lingual walk . Cornish language lesson for beginners. Part 1 of 5. Professor Williams was the first professional Celtic scholar to study revived Cornish in depth and published Testament Noweth, the first complete Cornish translation of the New Testament from the original Greek in 2002. Starring Kernow King and Mary Woodvine. Kernow King is Trevithick! The gripping story of not just one of Cornwall's greatest sons, but one of the greatest men in history. "Trevithick!" is ‘bursting’ with music, comedy and facts and still relevant to the world we live in today. MAGA, the Cornish language partnership has been awarded Heritage Lottery funding for the 'Dasserghi Kernow' project to explore and share untold stories about the revival of the Cornish language, including the work of Henry Jenner (pictured). If you have any copies of early examples of revived Cornish or information then we would like to hear from you! Horticulturalist Wella Chubb will lead a guided walk around Penzance's Morrab Gardens, famous for its Mediterranean and sub-tropical plants. Cornish language lesson for beginners. St Piran Procession (children) leaves the top of Causewayhead. This workshop will show how the Cornish language can be used in heritage projects, providing lots of examples and ideas as well as correct usage. The ancient land of Cornwall is steeped in mysterious tradition, proud heritage and age-old folklore. Before books were widely available, wandering 'droll tellers' used to spread Cornish insight and humour to all parts of the Duchy. Matthew Clarke will recount some of the most well-known tales. Multi-award winning folk band from Looe. The Changing Room tracks feature regularly on national and international radio, and they are particular favourites of BBC Radio 2, 3 and 4. "Rootsy original music with a dash of Cornish language and a good dollop of humour"
How well do you know Penzance? Find out in an exciting town trail competition! Matthew Clarke is a communications professional and fluent Cornish speaker. This workshop will provide a wide range of ideas on how using the Cornish language can help businesses and how it can be used in social media. Cornish Folktales and ‘The Story of Uny and Ia’ with Pol Hodge. Bi-lingual storytelling event with one of the most entertaining of Cornish entertainers - poet and author Pol Hodge. 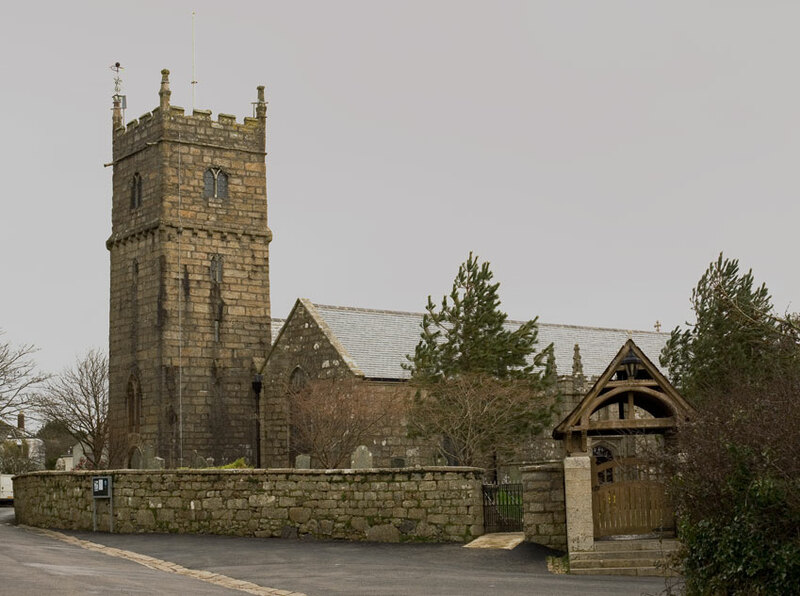 Pol will reveal the story Uny and Ia - brother and sister - and the founding saints of Lelant and St Ives as well as bringing some favourite Cornish folktales to new audiences. 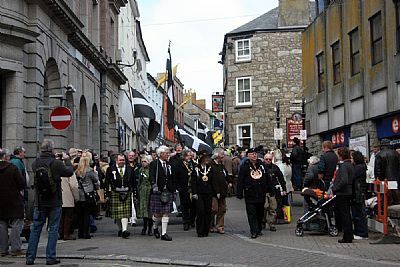 Processing with the St Piran Statue, the Cornish choir Keur Heb Hanow and Bal Maidens in traditional costume on the traditional route from Penzance to the original mother church at Madron. The St Piran Play with the Heamoor Cornish Language Class. 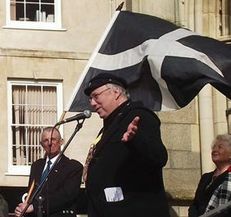 Shout West with Pip Wright, and 'The Songs the Cornish Love to Sing"